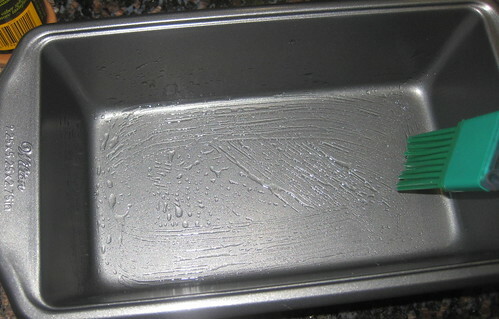 Grease bread baking tin with oil and preheat it 190 degree C for 10 minutes. In a bowl add bananas mash nicely with forks or your hands. Take a bowl and add oats,whole wheat flour ,all purpose flour,salt,chopped almonds,cinnamon powder,baking powder,baking soda and mix well. In another bowl add smashed banana (about half cup),milk,yogurt,oil,honey and beat well. Keep adding the dry ingredients in small quantity into the wet ingredients and mix with a spatula. Pour the batter into the pre heated baking tin ,sprinkle a tbsp of oats over the batter and bake at 190 degree C for 30 minutes or till the top turns golden brown in color.Take out from the oven and insert a clean knife or tooth pic ,if it comes out clean the bread it done. Let stand on wire rack for 20 minutes,run a knife around the tin to loosen the bread and turn it on a flat board.Cool ir completely before slicing it ti get even slices. The bread is midly sweet,add extra sugar if you like sweet bread. Baking time may change due to the variations in oven temperatures. Yogurt or curd used here is fresh and thick. Quick coking oats does not need to be soaked in liquid before using. moist soft and spongy banana bread. Looks healthy and delicious. Do send to food event Healthy Me and Healthy Us @ Annarasa! Super moist n delicious bread...looks lovely! Delicious banana bread very moist, hard to say it is eggless. 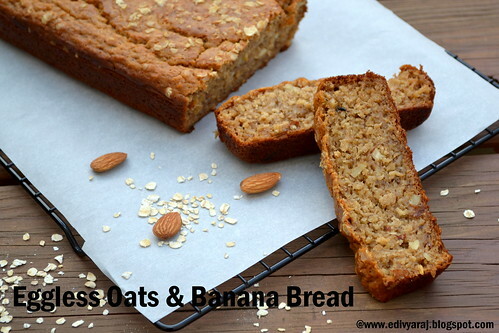 wow... wonderful combination of bananas and oats... delicious!! I LOVE THIS CAKE AND USUALLY MAKE THEM AT HOME. NICE CLICKS DEAR.. Delicious and mouthwatering bread. Looks pretty wholesome. know what Divya ..even a policeman will turn a professional cook just by religiously following your blog. You explain things soo well..detailed step by step posts. Really appreciate it. And the bread is simply gorgeous ..so healthy too !!! bookmarked. Must be soft and sounds really healthy too! I love banana bread .. with cinnamon flavour it is awesome. This looks so healthy and delicious. 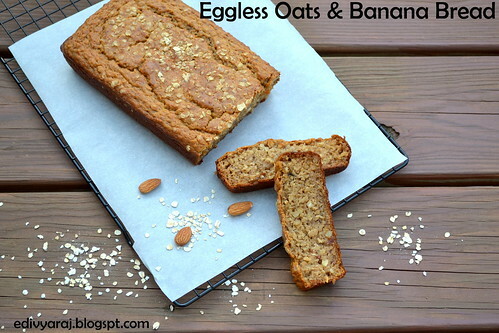 A great recipe for summer when there are always overripe bananas sitting in my kitchen. 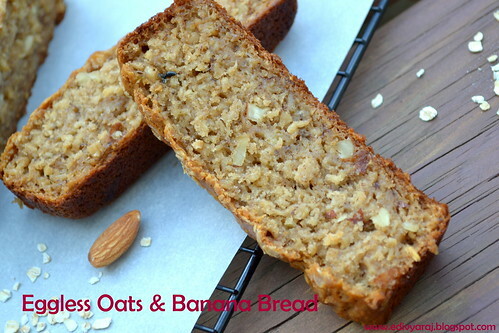 This quick bread sounds great, healthy & super delicious! Tempting & healthy recipe.. Loved those perfect set of pics.. Yummy !! Se ve muy rico muy tentador con banana,daludos. 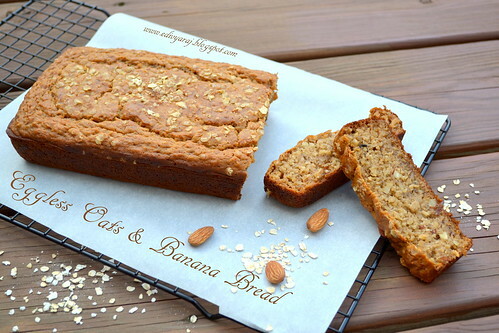 I love banana bread and love your no egg version. Thank you for sharing. Have a great weekend. 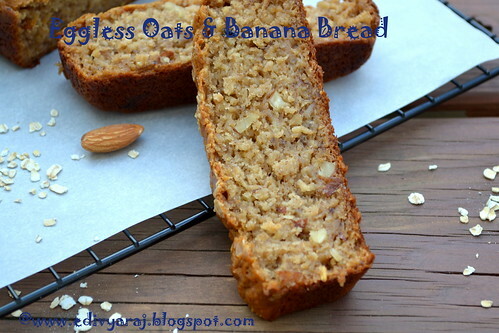 Banana breads rock :-) even i've made a similar version with WWF n oats n all...looks yummy! Bread looks very healthy and delicious. that makes a healthy breakfast ! You are an excellent cook. Please keep posting yummy recipes.